Through ABC’s Ministries Christian Counseling & Life Coaching I specialize in Disordered Eating, Health & Wellness, and Issues of Abuse. I am a Board Certified Christian Counselor through the Board of Christian Professional and Pastoral Counselors, and a Board Certified Advanced Christian Life Coach through the Board of Christian Life Coaches. I surrendered to full time vocational ministry in the late 1990′s which prompted me to begin graduate school in 1999 at Trevecca Nazarene University, Nashville while working full time at Thomas Nelson Christian Publishers. In 2000 I transferred to Morehead State University, Morehead, KY where I could focus full time on finishing graduate school. In 2003 I received a Master of Arts degree in Adult & Higher Education, Counseling Specialization. 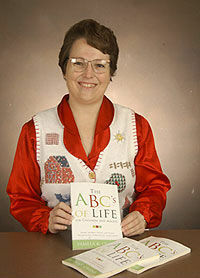 Also in 2003 I published the book entitled The ABC’s of Life for Children and Adults: Short Stories, Essays, and Poems Promoting Christian Concepts (Xulon Press). ABC’s is an acronym for [Abolishing apathetic attitudes, Building biblical behavior patterns, and Choosing Christ-like character. Thus, ABC’s Ministries, also established in 2003, was named after my book. In 2006 I disbanded ABC’s Ministries. In 2007 I returned to Morehead to finish an Education Specialist degree, also majoring in Adult & Higher Education, Counseling Specialization. The thesis I completed to receive this degree was entitled Exploration Linking Self-Reported Disordered Eating and Wellness in Undergraduate Health Students. After receiving the Ed.S. degree in 2009, I moved back to Nashville where my fiancé and I restarted ABC’s Ministries in 2010. Through different churches over the years I have gained valuable ministry experience. In 1996 and 1997 I served as a volunteer Special Project Coordinator for an annual children’s Christmas party at Cottage Cove Ministries, Nashville. In this position I planned and implemented fundraisers, handled promotions for gift and financial donations, recruited other volunteers, and organized activities the day of the event. Also through the church I am an experienced lay counselor and Sunday school/Vacation Bible School teacher. From 1986 through 2000 while a member at Two Rivers Baptist Church, Nashville I completed a number of Church Training courses. These courses include Evangelism Explosion, Meeting Needs; Sharing Christ, Master Life I, Master Life II, Making Peace With Your Past, The Search For Significance, Decision Time, Weigh Down Workshop (also co-teacher after completing course), The 7 Laws of the Learner, How to Live a Victorious Christian Life (book used: Handbook to Happiness: A guide to victorious living & effective counseling by Charles R. Solomon) and Experiencing God. In 2002 I joined American Association of Christian Counselors. In 2010 I received an Advanced Diploma in Biblical Counseling from Light University. Courses completed through AACC/Light University include Healthy Sexuality, Heal Our Land (Trauma & Grief Counseling), Caring for Kids God’s Way, Small Group Leader, Caring for People God’s Way, Breaking Free, Health & Wellness Coaching, and Professional Life Coaching 101. I also am a member of International Christian Coaching Association and Christian Association for Psychological Studies. For more information or to make an appointment please contact me by email at abcsministries at yahoo.com or visit ABC Ministries Christian Counseling and Life Coaching.